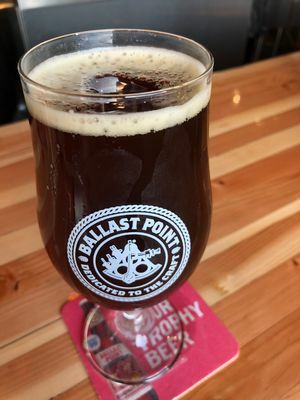 Ballast Point Brewing Company is a San Diego-based craft brewing company that is "Dedicated to the Craft." 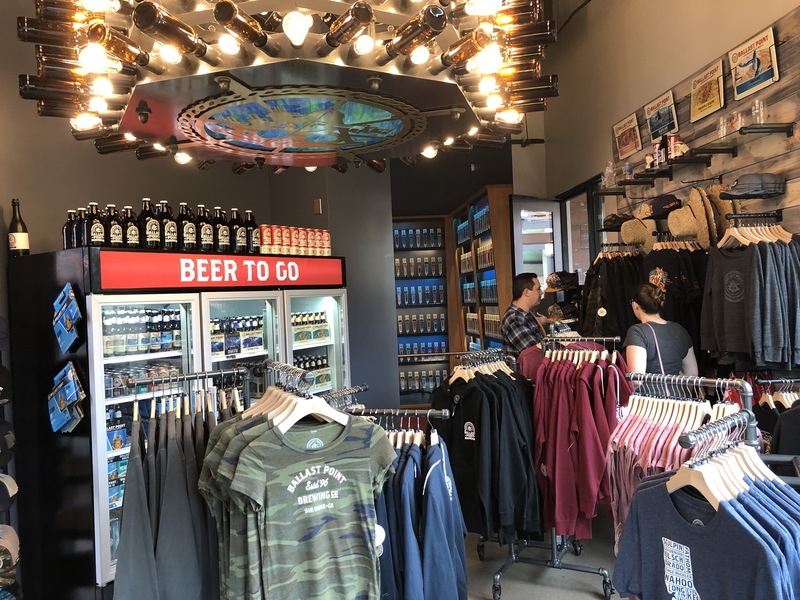 With locations in San Diego, Temecula, Long Beach, Chicago, and Daleville Viriginia they have just opened their newest location in Downtown Disney and MousePlanet was there to sip, savor and learn all about brewing beer. It's located directly across from Catal and Uva Bar on the upper level. The annual pass discount will not be available until some time in February, and that of course does not include beer and wine. Guests check in downstairs, and like many other restaurants you may leave your phone number to receive a text when your table is ready. When you are buzzed, you can head upstairs and check in with the host staff. You are greeted with a wall of taps upon climbing the stairs to Ballast Point. Photo by Todd Pickering. The bar is first come, first served; there are a lot of bar tables and a counter along the window to watch the hustle and bustle of Downtown Disney. Photo by Todd Pickering. It is nice to see a great big bar area that is first come, first served. There are a lot of high-top tables surrounding the bar and a counter alongside the window with stools to look out the window at all of the activity in Downtown Disney. The windows really give the restaurant a lot of natural lighting, and make the space feel more open and inviting. There is also a patio that is currently is first come, first served. The feel of the restaurant and bar is very industrial, and it can get a little loud inside if the place is full; we expect that will be the case for quite some time. The dining room is behind the bar area. Photo by Todd Pickering. The dining room is very modest, so the wait times have been quite long for tables on the first full week. There is a fantastic reproduction of one of Paul Elder's artworks (the artist for Ballast Point), a beautiful fish from the Sculpin Beer bottle labels. Beer bottles housed in a whimsical wine-rack style also take up one side of the wall. The restaurant does take reservations, so if a craft beer is your thing and you are touring the parks on a limited schedule, we highly recommend making those reservations. 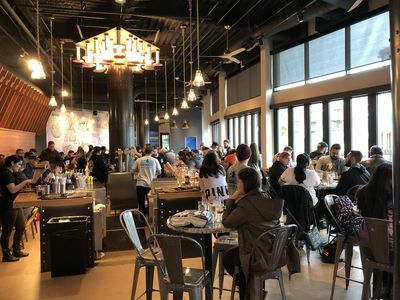 Again the dining room is very industrial as the space really is just one big room, so it isn't a quiet dinner but Downtown Disney does tend to be lively. A wall of beer bottles is a great touch in the dining room. Photo by Todd Pickering. The beer made on location is notated on the menu. Photo by Todd Pickering. 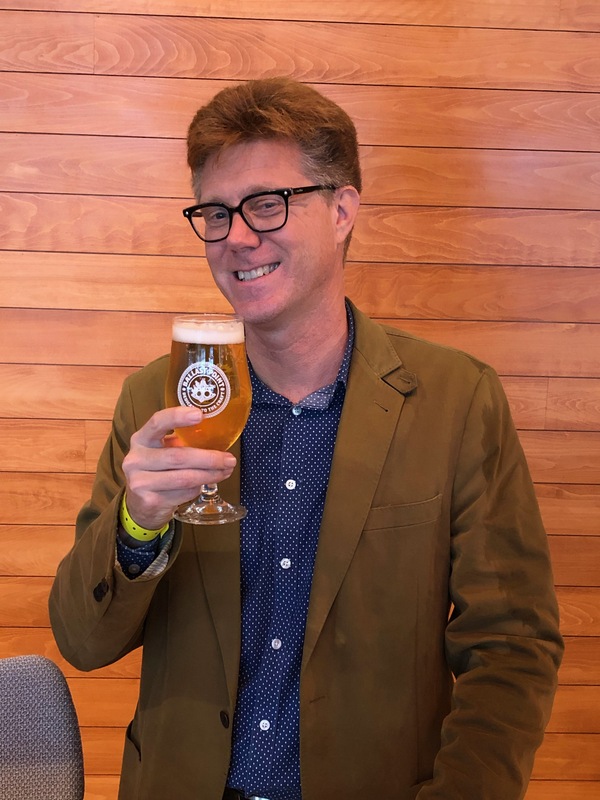 Ballast Point has been around for over twenty years, and Colby Chandler has been brewing beers with them for almost as long. We got to talk to him about the process of making beer. 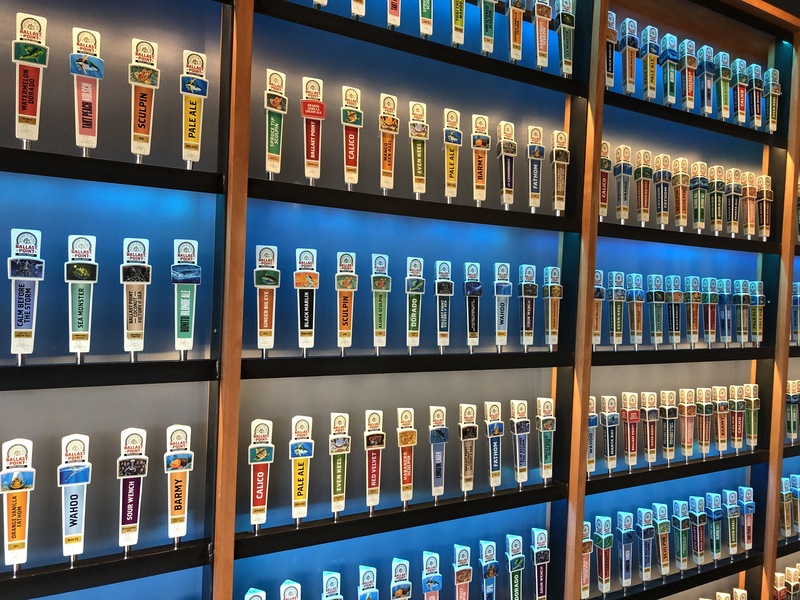 With over a hundred styles of beers and 500 different strains of yeast, the combinations and flavor profiles are endless. Most of the beer is of course brewed down in San Diego. With over 30 different styles on tap, it makes sense. 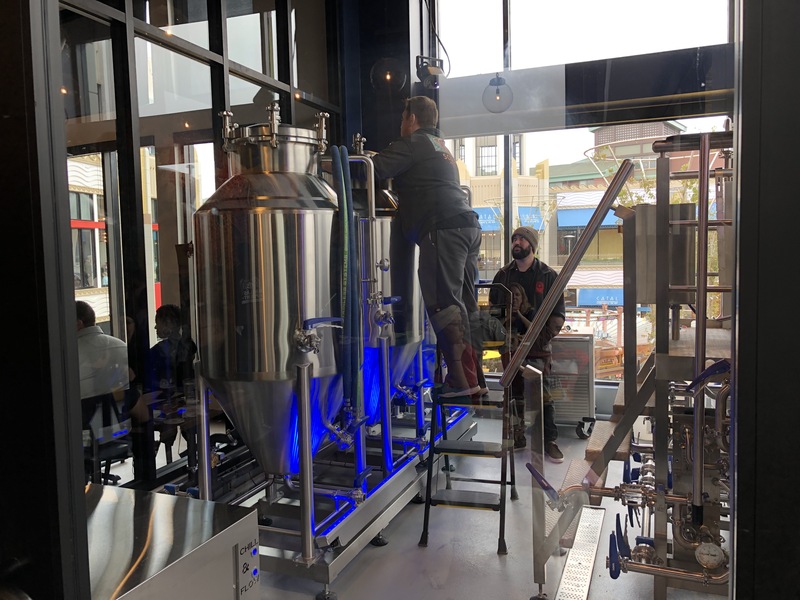 There are two fermenters and one finishing tank on premises, and it was fun watching them work on the brewing of the beer. 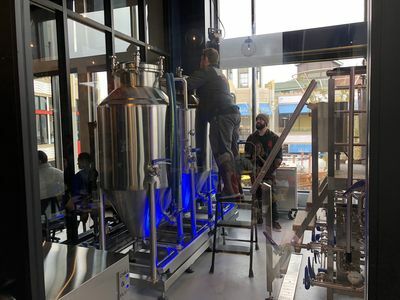 The menu and the staff will be able to tell you which beer is brewed on premise. Mr. Chandler says these will go faster than you think considering the tanks hold six kegs! You can easily see these tanks from the outside and from both the bar and dining room as they are in a glass room. The bartenders were all very knowledgable and excited to talk about each beer. You are able to purchase eight or sixteen ounce beers, and flights of four four-ounce pours are available. No liquor is available at this bar, but a nice wine selection is available for that lone oenophile in your group. Pumpkin Down Scottish Ale. Photo by Todd Pickering. The whole raison d'etre of Ballast Point of course is the brew, so let's talk beer. With almost 40 beers on tap we really looked to the bar staff for help. We met and chatted with four different bartenders; on opening day these people truly knew their stuff, and were enthusiastic about talking beer. The blonde is definitely a very approachable and easy drinking sunny-day beer. It has a really nice, toasty nose with a balanced finish of hops and malt, which is what the menu description states. The amber is their most award-winning beer, and is listed as an "American Amber Ale that's ESB-inspired with a balance of malts and hops." It has nice maltiness with a bit of cocoa and a nice toasty finish. You can see why this wins the awards; if you are overwhelmed by the menu go for this brew. Indian Pale Ales can be so big, bold, and high in alcohol that there is no finesse to them at all. This brew is a kinder and friendlier version of any IPA we have ever tasted. You can tell that it is indeed higher in alcohol, but the flavors still come out with a lighter color than usual for an IPA; it shows that the crafting of a beer truly has an effect. The menu states that this beer has "Bright, floral hop flavors of apricot, mango, and lemon," and we think this description is right on the nose. This beer won the 2017 GABF Silver medal in the Fruited American Style Sour division. Sour beers are definitely not something for the beginner, but this "tart and sweet Berliner Weisse-style with Oregon State Marion blackberries" is a great way to ease into sours. Sour and fruit flavored beers are generally not to my taste, but the berries do not overpower this brew and the balance of tart and sweet is perfectly balanced making this very easy-drinking. These beers are also available in styles that have been aged in both red and white wine barrels. These impart a bit more of the tartness to the flavor by aging longer and having contact with the wood. Both barrels imparted a smoky flavor but we liked the fuller flavors of the red wine barrel as they were more distinct and seemed to complement the blackberries. The pumpkin and spice craze has reached its height, and Ballast Point Brewing has crafted their entry. We declare this beer a big winner. 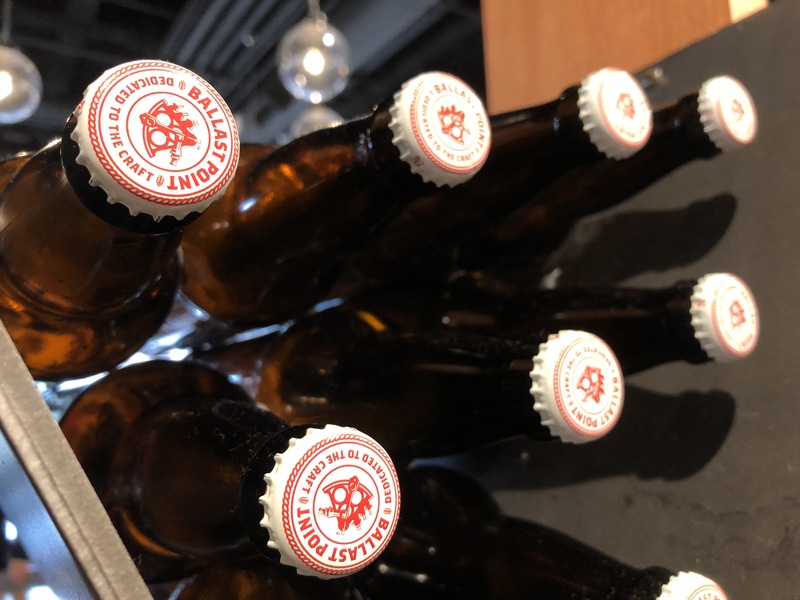 It is a Scottish Red Ale style that does indeed have a pumpkin puree in the blend, along with a proprietary blend of spices, but the predominant flavor is still beer. The pumpkin adds a weightiness and richness to the brew, and the spices are very light and subtle allowing for the malt and the hops to still shine through. We decree this the best example of pumpkin and spice. This is a "robust Imperial Porter with Cafe Calabria's Victory at Sea coffee blend and vanilla." Not unlike the Scottish Ale, the flavor of the coffee and vanilla are carefully woven into this beer allowing for the richness and maltiness of the porter to shine through. 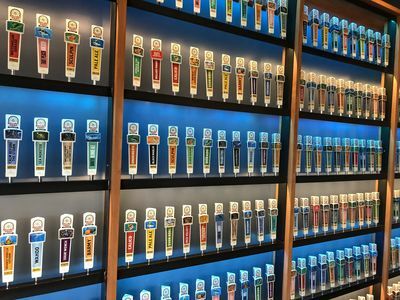 In talking about beer, cocktails, and food, the word "crafting" can be tossed around way too much; Ballast Point seems to take the true definition of the word and follow through on their commitment to be "dedicated to the craft". 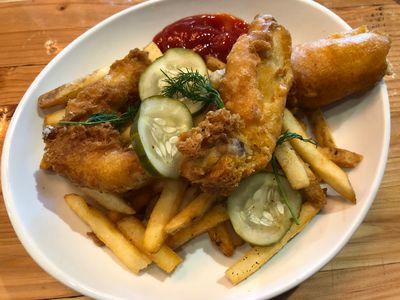 The BP beer-battered fish & chips is delicious. Photo by Todd Pickering. We got to speak with Executive Chef Colin MacLaggan. 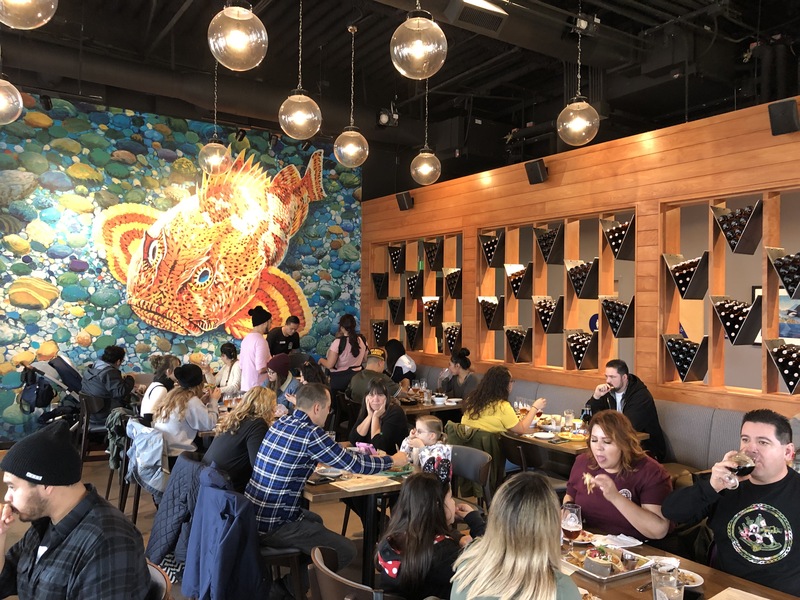 He oversees all of the Ballast Point Brewing Company restaurants and Executive Sous Chef Joey Lerma will be at the helm in Anaheim. The menu will change every three months and use the most fresh, local, and sustainable products available. We were enjoying our Fish & Chips when he arrived and he let us know that they were currently using mahi mahi but you may find the fish to be thresher shark, yellowtail, or ono depending on the season. This fish fry was not a greasy and gloppy style. The crust was golden brown and perfectly crispy even on the bottom. The fish was sweet, tender, and meaty. The fries had a lovely hint of malt to them and were crispy on the outside and nice and fluffy on the inside. The Blackberry Sour Wench cut beautifully through the Vinegar and made a lovely pairing. The BP Wings from L to R; Spicy Sculpin buffalo glaze, Crispy dry rub, Bourbon and Brown Sugar. Photo by Todd Pickering. The wings were some of the best wings we have tried. They are juicy and tender with a nice amount of meat on them. All three styles were delicious. The spicy Sculpin buffalo glaze served with blue cheese sauce wasn't terribly spicy, and we would give it about a five out of ten. 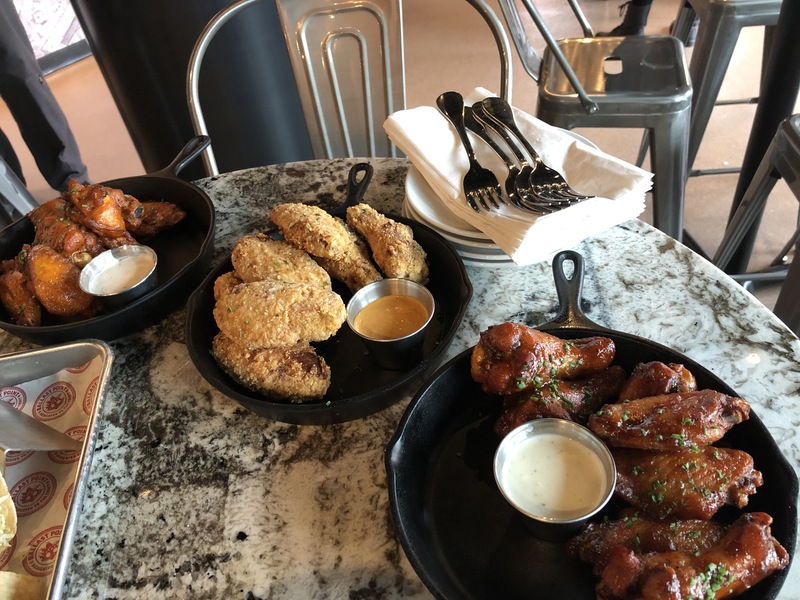 The crispy dry rub served with Southern-style comeback sauce were our favorite, which seemed to have just as much spice as spicy wings. The bourbon and brown sugar served with ranch were definitely a sweeter style, but the bourbon flavor came through and all three of them were so tasty they did not need their respective sauces to be enjoyed. I liked the Sculpin IPA paired with this, as the higher alcohol content paired nicely with the bold flavors of the wings. 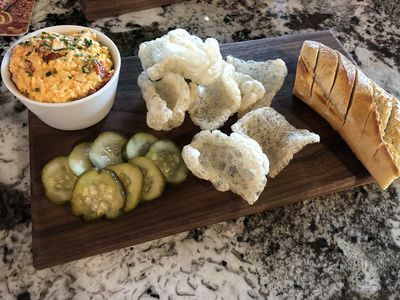 The house-made pimento cheese is fantastic. Photo by Todd Pickering. The house-made pimento cheese is so great with beer. This cheese harkens back to the 1970s but the freshness and natural ingredients make this a modern classic. It is served with chicharrones, grilled bread, and some of the crunchiest most flavorful bread & butter chips we have ever tasted. Go classic with this one and pair the California Amber, which keeps all the flavors clean and simple. One of the two dessert choices is "Victory at Sea" S'mores. Photo by Todd Pickering. 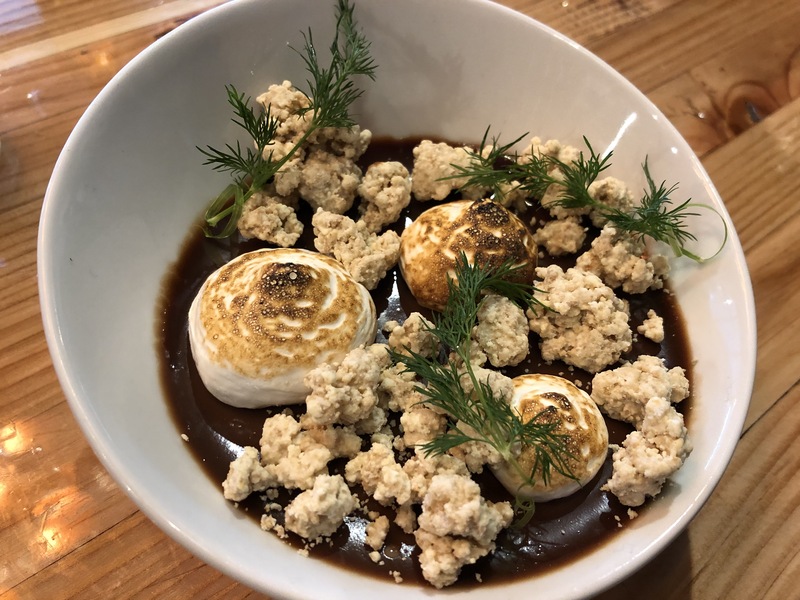 The "Victory at Sea " S'mores have the most wonderful rich and creamy chocolate custard flavored with the Imperial Porter. Homemade clusters of graham cracker and caramelized marshmallow top this dessert with a not unpleasant, but strange garnish of dill. We opted to leave that off. The Victory at Sea Imperial Porter paired with it really brought out the chocolate flavors and made for a very decadent dessert course. The menu also features a seven ounce chuck and brisket blend burger and an "Impossible" burger that is vegetarian. The Impossible lettuce cups are also vegetarian, and there is a Soyrizo and roasted cauliflower taco that is vegan. A great little retail area is also available, complete with beer to go. Photo by Todd Pickering. In the front of the restaurant is a little area for retail where you can also buy the beer and take it back to your hotel room. I think this will be very popular for guests staying on and off property especially for those crowded summer months and weekends. We couldn't think of anything better than sipping a bottle of beer on your balcony at the Grand Californian watching the monorail zip on by. There are also growlers available for take away, which will probably be a big hit for the locals. The staff wears t-shirts and a lot of them were available in the retail area. There are also lots of hoodies so there is bound to be something for everyone. 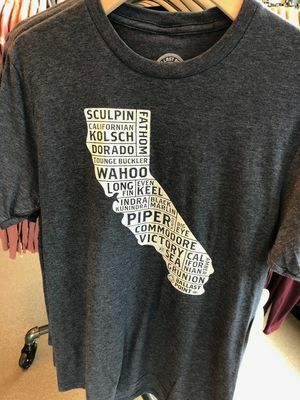 We think this T-shirt with Signature brews in the shape of California will be very popular. Photo by Todd Pickering. 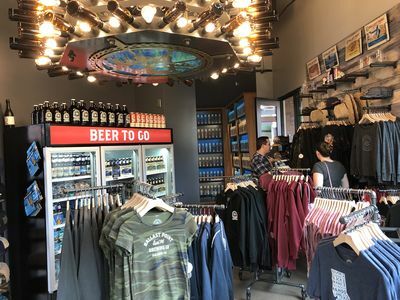 Ballast Point Brewing Company is such a great addition to the Downtown Disney line up. It certainly fills a niche by being the only craft beer location. The food is fresh, well prepared, and not overwrought. The staff is knowledgable and friendly. The space is bright, fun, and well lit. With all of these great components we raise a glass of craft beer and toast to a great first year at the Disneyland Resort with many more to follow. Cheers! Prost! Salut! Salud! Todd Pickering toasts to Ballast Point Brewing Company's "dedication to the craft." Photo by Roger Pickering.